When it comes to advertising for your photo booth business, one of the most common platforms is Google Adwords. This robust platform is responsible for more than 90% of revenue for Google Inc and most business owners know that you need to be on the first page to be successful. Let’s face it, no one is going to the 10th page of Google to find your photo booth service. While all of this stands true, there is still a large number of business owners who are not familiar with Google Adwords platform. While most people are not familiar with Google Adwords, there are some people who are familiar but don’t how to maximize it to its capabilities. I used to be one of those people until I realized that Adwords is not going anywhere. I now understand that it is such a huge part of any business current or future. After that realization, I decided to dedicate a lot of my time to learn as much as possible regarding this platform. Five years and thousands of dollars later, I’m here to talk to you about four ways you can reduce your ad spend and increase conversions. These tactics have allowed me to grow my business from $0 to $156,000+ in our first year of PhotoBoothDallas.com. 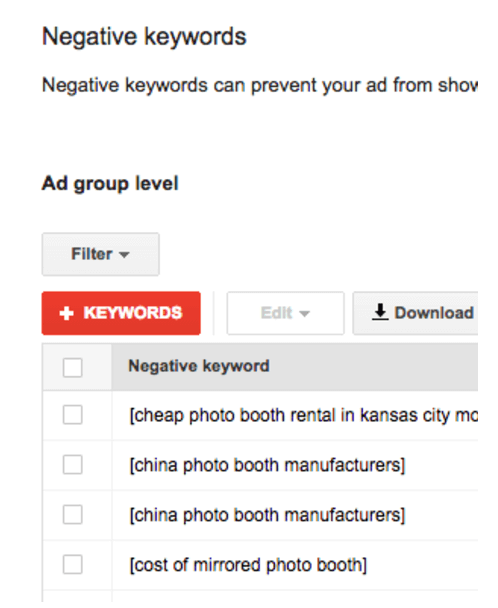 Negative Keywords – Just like there are keywords that are directly correlated with your business, there are also keywords that Google believes are linked to your business but have no correlation. It is important to tell Google which keywords would not help your business be seen because there are many search terms that Google associates to your business for one reason or another. For example, I would mark the keyword “cheap photo booth rental Kansas MO” as a negative keyword because I do not serve Kansas; I serve Dallas, TX. It is important to mark these negative keywords as they will help you target the right audience as well as save money in ad clicks. – Login to Adwords click on Keywords then click Search Term Reports. – On the top right-hand side, you can change the timeframe to 30 days or 90 days. To start, select 90 days. (As you get into the habit or doing this on a monthly basis, you can reduce to 30 days). The search term report will tell you what keywords or search terms your potential customer keyed in to trigger your ad. Comb through the list and select the ones which are not related to you and click “add as negative keywords”. Over time, Google will only present your ad to the most relevant search term which results in lower ad spend and better clients. Conversion Tracking – Conversion Tracking tracks a visitor from Google all the way through your website until they have completed the goal you have set for them. In our case, the goal is for the guest to fill out the lead form for a quote. Setting up conversion tracking is a crucial step because Google will help you by serving ads to those customers who are more likely to convert. You also use this to see how many conversions you get per dollar amount spent. If you don’t have this setup, then you don’t know what ad or keyword is working, and you are just spending money blindly. A huge benefit of this tracker is that you are actually able to see what is working and what isn’t. You can then increase the budget on the keyword that is working which and lower the budget on the lower converting keyword. This simple method will save you time and money. Login to Adwords click on tools then conversions then click on the “+conversion” and follow the steps. For our company, we have it set up to where the conversion is triggered when the visitor reaches out thank you page. The thank you page only comes up after the visitor fills out the contact form. Setting up a page that redirects your visitors will make tracking very easy. 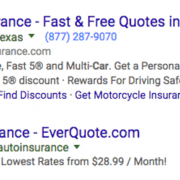 Ad Extensions – This is by far one of my favorite features with Adwords using ad extensions will help you dominate the search by getting you the most real estate on the results page. As you can see from the example below, the Esurance ad is using all of the extensions. It is important to ask yourself which ad you would likely click on. I would personally click on the Esurance ad because it contains the most information at a glance. These extensions are all free and included with your Adwords accounts. How To Add Extensions – Login to Adwords click on Ad Extensions and use the drop-down on the left to view the different options, try to add all of them if you can. I hope this helps you out by reducing your ad spend remember that Adwords does have free tech support so you can always call them for help if you get stuck. Congrats on starting your Photo Booth Business and making it this far, starting my business was the best decision I ever made. It has not been easy, but that’s what comes with being an entrepreneur. 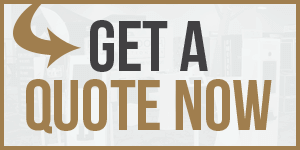 If you are looking to start or expand your photo booth business, please have a look at our website where you will find information on all of our photo booths for sale.